In order to accomplish the business targets, Santierul Naval Constanta SA is operating within a frame governed by a Quality Management System in accordance with DNV-GL ISO 9001:2008. As regards to the Environmental Management System, our company has obtained the certification in accordance with ISO 14001:2009. 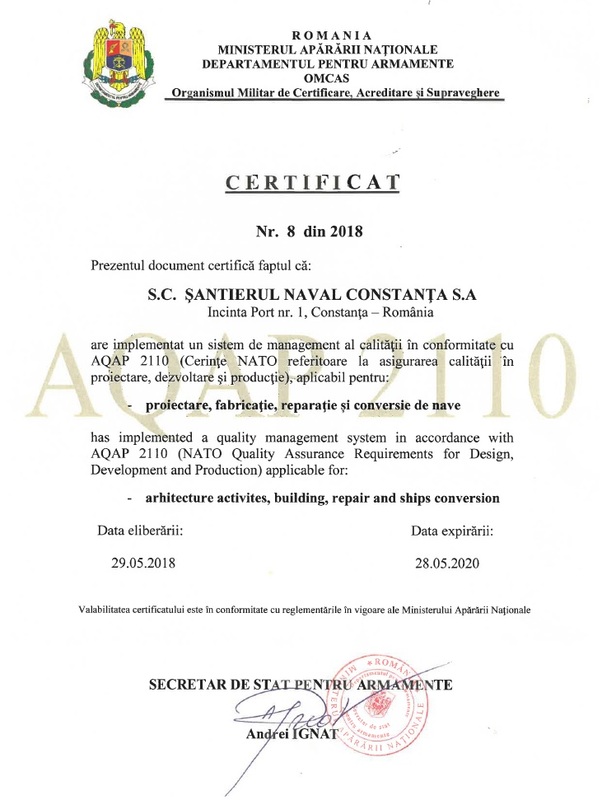 Certification for NATO Standard - AQAP 2110: Constanta Shipyard is the principal contractor for Romanian Navy. 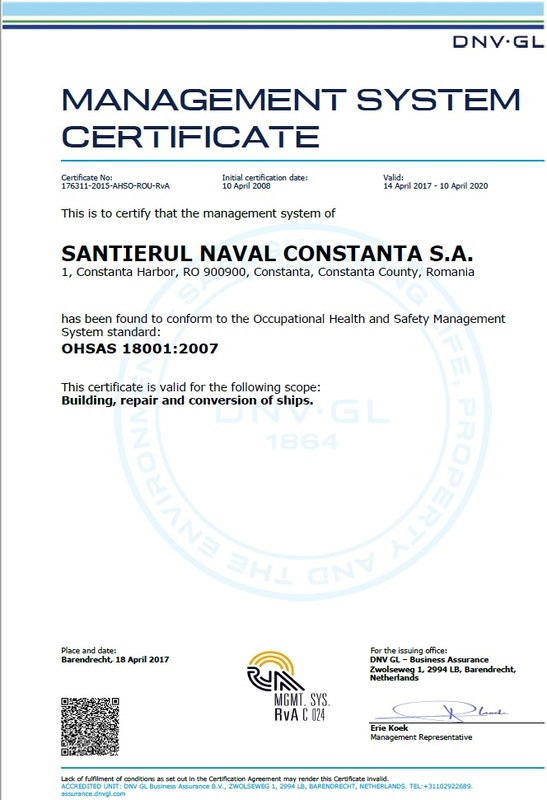 The latest certification obtained was for the Occupational Health Safety management System, in accordance with OHSAS 18001:2007, SNC being the first Romanian shipyard to integrate Quality – Health – Safety and Environment Management systems. The role of the Classification Societies is becoming more and more important during the last years, both in terms of supervision during vessel's construction and during its operation. As a traditional approach, the supervisors from the Classification Society are the independent party that guarantees the vessels' building strictly in accordance with the rules and regulations referred to in the contract signed with the shipyard, while the imposed quality standards are observed and complied with by the shipyard. 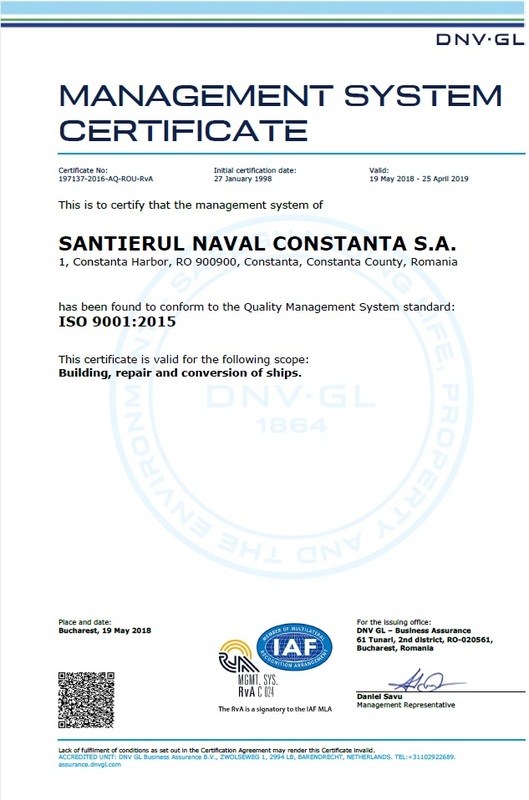 Santierul Naval Constanta SA is fully aware that the customers’ satisfaction is of paramount importance for its development and success on the international shipbuilding market. Therefore, the core of our policy is to provide products and services that meet or even exceed the clients’ expectations as regards to their quality, safety, performances during operation and environmental approach. A permanent task of our company is to ensure that offered products and services are delivered on the agreed time schedule and complying with the statutory requirements and international fabrication standards; the customers' satisfaction is monitored on a regularly basis through specific procedures aiming to optimize our activity, from the design stage until delivery of the final product, covering also the warranty period.